Cappuccino specializes in digital content, technology production, and strategic planning. Executives from Cappuccino and Weber Shandwick in Brazil. 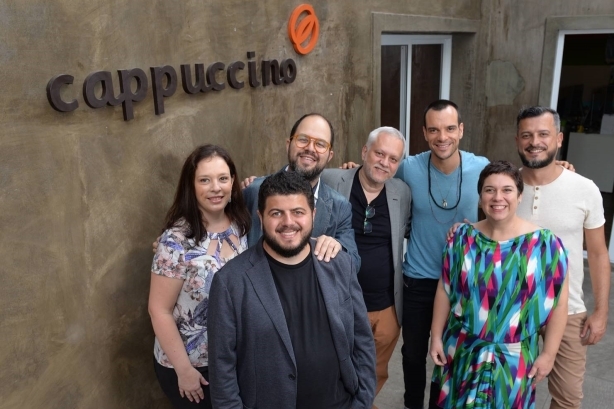 SÃO PAULO: Weber Shandwick has acquired Cappuccino, a digital marketing and technology agency based in São Paulo, Brazil. Founded in 1998, Cappuccino specializes in digital content, technology production, and strategic planning. Cappuccino’s digital services include content creation, social media, mobile, paid distribution, SEO, UX, and design and development, according to a statement from Weber. Cappuccino will retain its brand and no layoffs will result from the deal. The firm has more than 60 staffers, who will report to Ze Schiavoni, Weber's Brazil CEO. "Cappuccino is doing very well in the local market, but they love the idea of being part of a global agency," said Laura Schoen, Weber’s chair of Latin America. "They are open to collaborating in Brazil with our existing group, but also having a dotted line and working closely with our [content unit] MediaCo." The acquisition creates no client conflicts, said Schoen, who noted that Weber and Cappuccino already share some clients, such as Sanofi. Other Cappuccino clients include Ajinomoto, Arcor, Boeringher Ingelheim, and Citi. Schoen explained that one of Weber’s goals in Latin America is to go beyond traditional PR. The region, she said, is "too focused" on media relations and corporate media training. "Cappuccino gave us additional power in integrated, creative, and digital solutions," said Schoen. "In Brazil, when you need to pay for play, you have to be an agency that has the approval of regulatory bodies to do that. Cappuccino also brings that." Schoen also sees Cappuccino as a firm that does well not only in Brazil, but in Latin America as a whole. She said the firm will help Weber’s offices in Mexico, Colombia, and maybe even outside of Latin America. Last week, Weber opened an owned office in Bogota, Colombia, to expand its presence in Latin America. Weber has owned operations in Brazil, Colombia, and Mexico, as well as affiliate partnerships in Argentina, Chile, and Peru. Weber saw a rare decrease in organic revenue in the first quarter of 2018, with agency CEO Andy Polansky saying the firm’s Q1 revenue "grew by low single digits on an as-reported basis and declined slightly on an organic basis." PRWeek’s Agency Business Report 2018, released last month, showed Weber’s performance was flat in 2017, with global revenue stagnant at $805.5 million, compared to organic growth of 10% in 2016. It is the second-largest PR agency in the world by revenue.